Hieronymus Bosch (c 1450–1516), Passion Scenes (detail) (c 1490-95) (CR no. 6B), oil on oak panel, 63 × 43.2 cm, Gemäldegalerie, Staatlichen Museen zu Berlin, Berlin. Photo Rik Klein Gotink and image processing Robert G. Erdmann for the Bosch Research and Conservation Project, via Wikimedia Commons. When I was writing yesterday’s article about Bosch’s Passion Scenes (c 1490-95), it struck me how unusual it was to see a painting by a master in which multiple scenes from a narrative were arranged in a circle. In this particular case, Bosch uses a mixture of multi-frame and multiplex narrative modes, which again is rare, perhaps unique. This article explores some other comparable paintings, to assess how unusual Bosch’s is. Multi-frame paintings are by no means uncommon, but most usually adopt rectangular or square form. Indeed many of the more spectacular frescoes are in effect multi-framed, where there are several images on a single continuous surface. This is similar to the much more recent development of comics/BD/graphic novels, or whatever you wish to call them. Gaudenzio Ferrari (1475–1546), Stories of The Life and Passion of Christ (1513), fresco, dimensions not known, Church of Santa Maria delle Grazie, Varallo Sesia (VC), Italy. Wikimedia Commons. 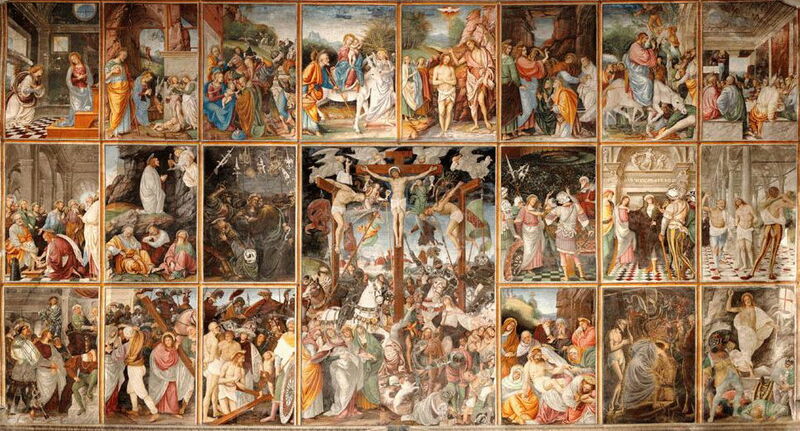 Gaudenzio Ferrari’s Stories of The Life and Passion of Christ (1513) arranges twenty frames covering the life of Christ around a central frame with four times the area of the others, showing the crucifixion. The frames are still read from left to right, along the rows from top to bottom, although the crucifixion is part of the bottom row. This is a layout which is commonly used throughout graphic novels too, of course. Hans Sebald Beham (1500–1550), Scenes from the Life of David (1534), oil on panel, 128 x 131 cm, Musée du Louvre, Paris. Wikimedia Commons. The four separate episodes which make up Hans Sebald Beham’s Scenes from the Life of David (1534) are arranged in a square, so that each occupies a triangular frame, clearly separated from the others, and quite different from a normal linear layout. The snag with this is that the panel is really only suitable for viewing when laid flat, on a table, otherwise only one of the frames is correctly orientated. Beham clearly liked the symmetry afforded by this layout, and enhanced it in his composition of the two frames shown here at the top and bottom. 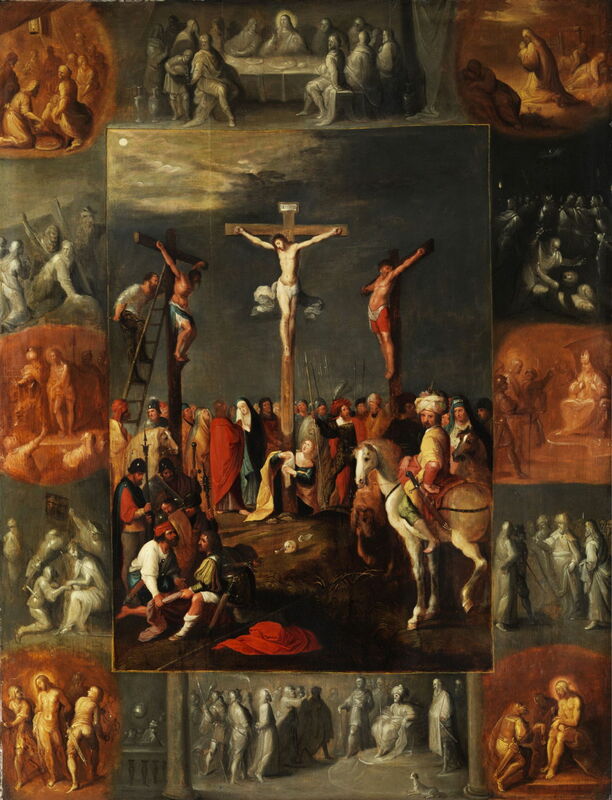 Frans Francken the Younger (1581–1642) attr., The Crucifixion of Christ, with Scenes from the Life of Jesus (1600s), oil on oak panel, 91 x 70 cm, Private collection. Wikimedia Commons. Frans Francken the Younger’s The Crucifixion of Christ, with Scenes from the Life of Jesus (1600s) puts the crucifixion scene at the centre of a rectangle, around which there are twelve scenes from the life painted in either normal or brown grisaille. Unfortunately those peripheral scenes are difficult to differentiate from one another, thus to identify, but they appear to be read in a clockwise direction from the upper right, rather than linearly. The visual effect of the painting is impressive, but his use of grisaille and very similar compositions does not help those trying to read the painting. Unknown, The Virgin Mary (1700s), media and dimensions not known, The Serbian Church in Szentendre, Hungary. By Bjoertvedt, via Wikimedia Commons. 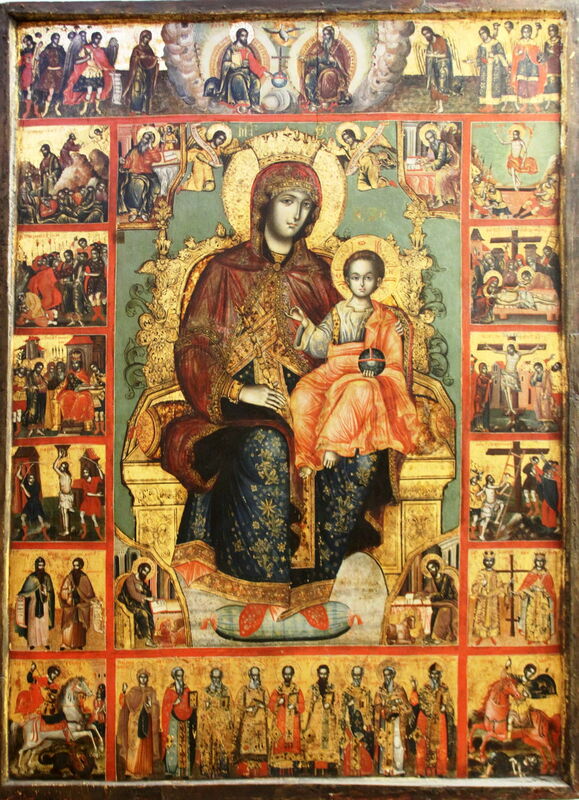 The painting of The Virgin Mary (1700s) in the Serbian Church of Szentendre, Hungary, uses a rectangular format with the Virgin and Child at its centre. Arranged around that are smaller frames, each showing an event in the life of Jesus. These appear to be read from the upper left in an anticlockwise sense, ending at the upper right with the resurrection, although only the ten frames on either side of the central image form the narrative sequence. 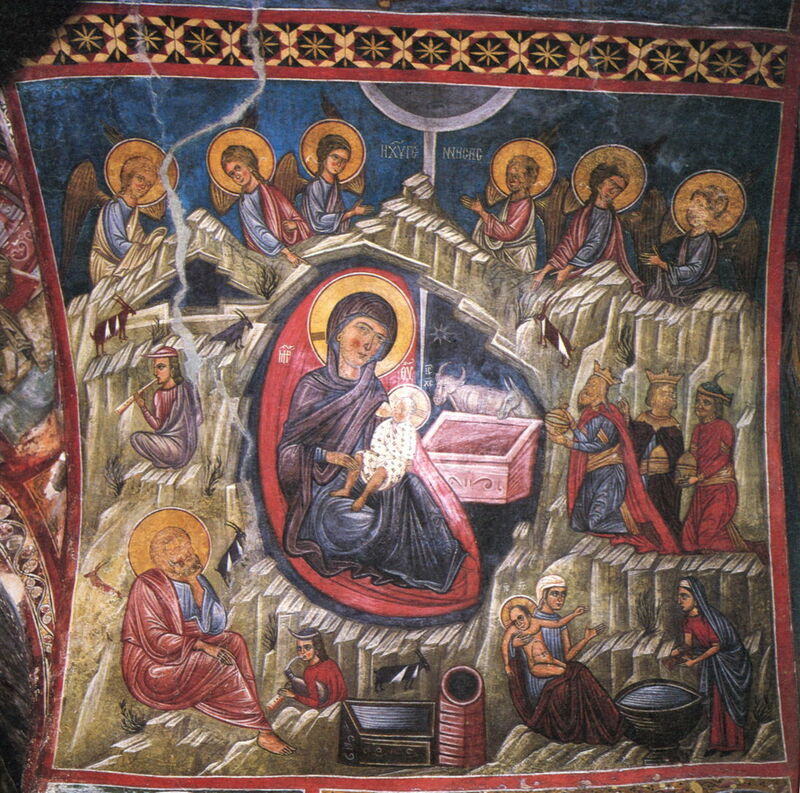 Unknown, Nativity of Jesus (1300s), fresco, Kakopetria, Cyprus. Wikimedia Commons. This fourteenth century fresco showing the Nativity of Jesus in Kakopetria, Cyprus, puts a series of frames showing individual events in the full story, around a central image of the Virgin and Child. This avoids repetition of that central image for the adoration of the Magi, for example, which is shown at the three o’clock position, so uses the format to help tell the story. 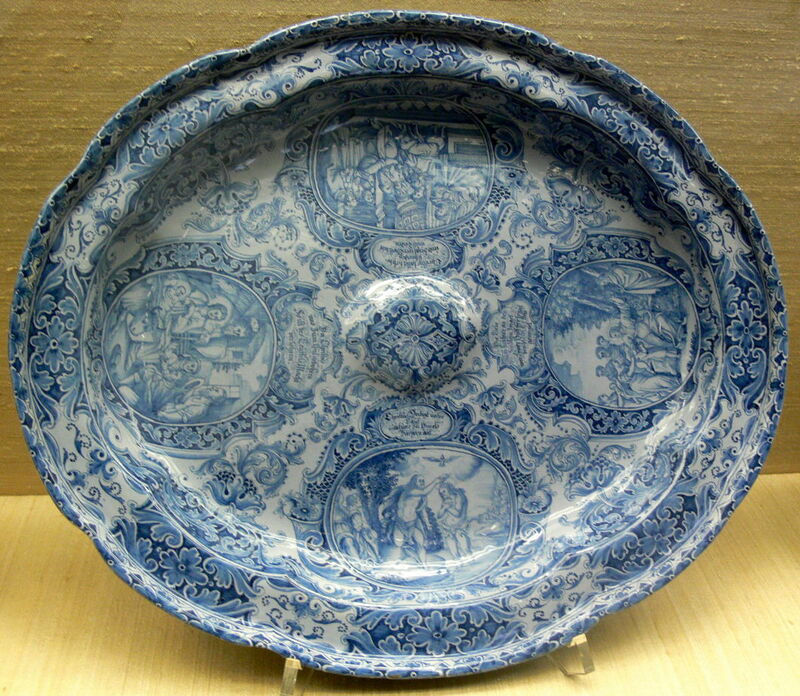 Multi-frame paintings arranged in the round are inevitably more common on porcelain and china, which often come in circular or oval plan. Georg Kordenbusch (1731-1802), Scenes from the Life of Christ (1750), baptismal bowl, Kunstgewerbemuseum Berlin, Berlin. By User:FA2010, via Wikimedia Commons. Georg Kordenbusch’s painted baptismal bowl shows four Scenes from the Life of Christ (1750). As these are intended for viewing from above the bowl, and normally by a group gathered round it, the layout of the scenes should not be orientated for viewing from a single position. Fedor Nikitin Rozhnov, The Passion of The Apostles (1699), media and dimensions not known, The Twelve Apostles’ Church, The Kremlin, Moscow. By Alex Zelenko, via Wikimedia Commons. Some artists have used circular elements within paintings which are still rectangular in overall form. 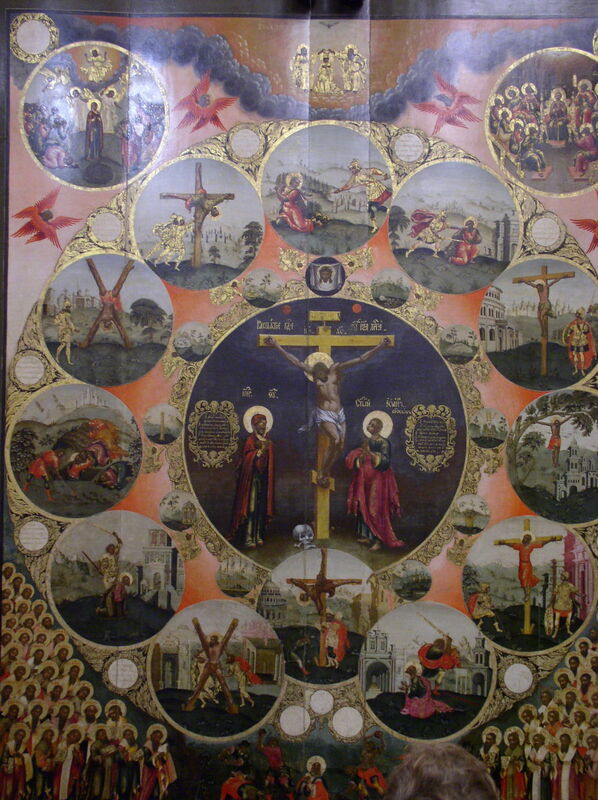 Fedor Nikitin Rozhnov’s The Passion of The Apostles (1699) arranges circular images of ‘popular’ scenes of the martyrdoms of the twelve apostles, around a central circular image of Christ’s crucifixion. Frescoes quite commonly occupy non-rectangular spaces, and have to conform to the surface provided. Girolamo Pellegrini (fl 1690), The Sick Presented to Charity by St Roch (c 1695), fresco, dimensions not known, Scuola Grande di San Rocco, Venice. Wikimedia Commons. 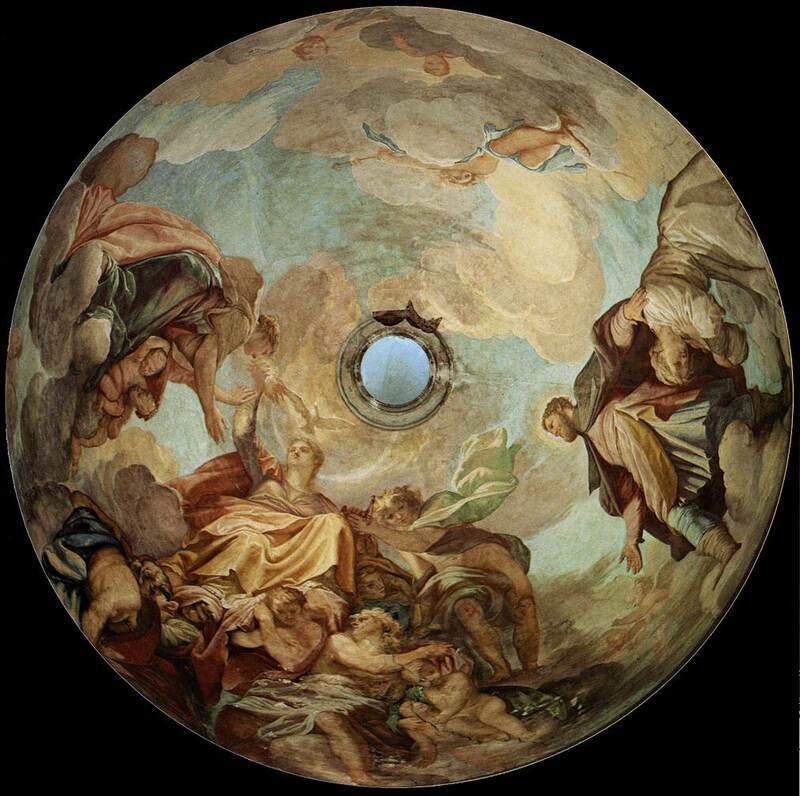 Girolamo Pellegrini’s fresco The Sick Presented to Charity by St Roch (c 1695) is painted inside a dome, and therefore is inherently circular, but does not exploit that for multi-frame narrative. Giovanni Battista Tiepolo (1696–1770), Discovery of the True Cross and Saint Helena (c 1743), oil on canvas, 490 cm diam, Gallerie dell’Accademia, Venice. Wikimedia Commons. 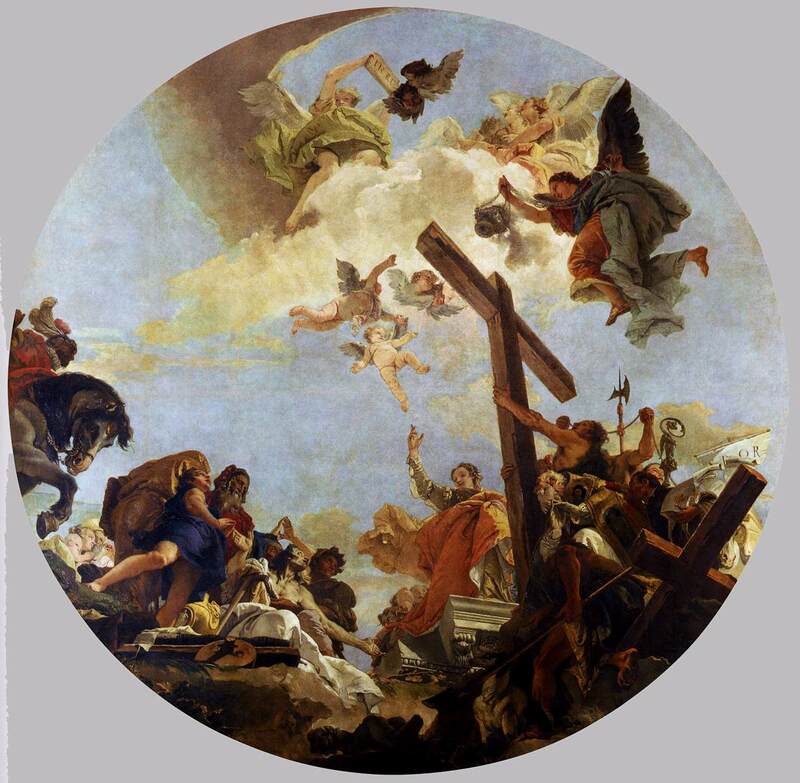 Although Tiepolo’s Discovery of the True Cross and Saint Helena (c 1743) is painted on a flat tondo (circular) canvas, it was intended for display from the ceiling of the Capuchin church in Castello. William de Brailes (fl 1230-1260), The Wheel of Fortune, from an illuminated psalter (c 1240), media and dimensions not known, The Fitzwilliam Museum, Cambridge, England. Wikimedia Commons. 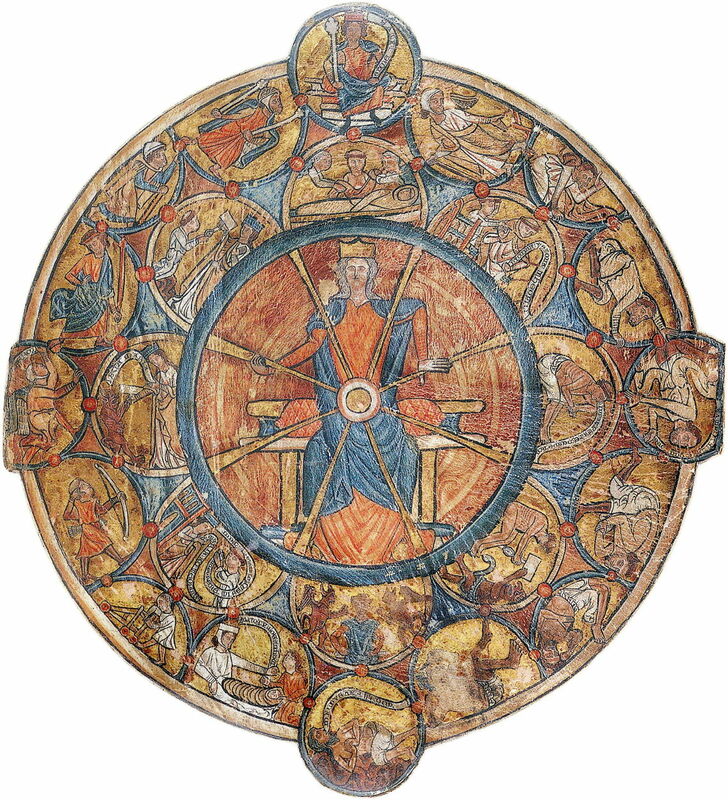 William de Brailes’ The Wheel of Fortune (c 1240) is based on this popular folk theme, but becomes more elaborate than most other depictions. At its centre is Fortuna, Roman goddess of fortune. The outermost ring of images – each a circular frame – show four different scenarios at the three, six, nine and twelve o’clock positions. 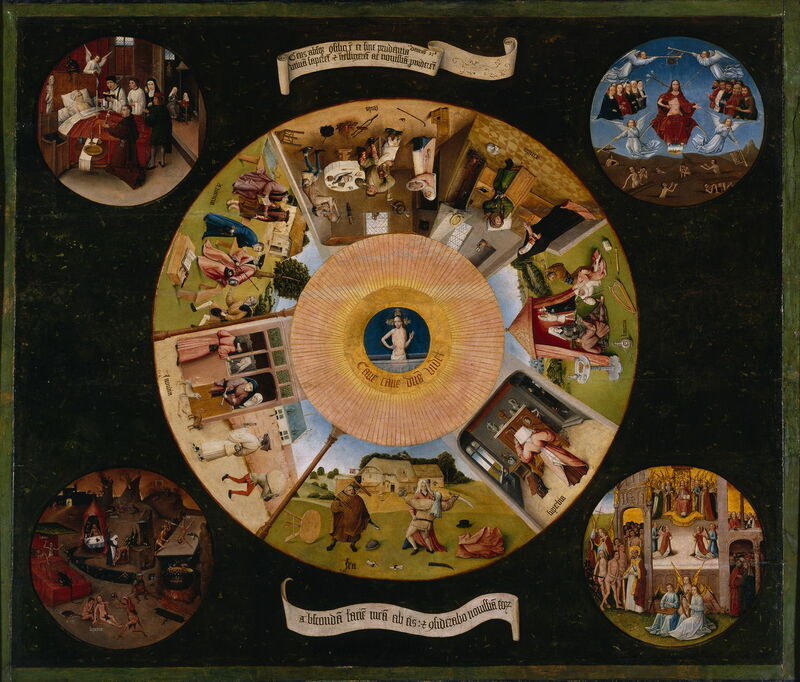 These are connected by half roundels showing twelve stages of life from the swaddled baby (at seven o’clock) to death at five o’clock. Inside those are inner half roundels showing scenes from the life of Saint Theophilus the Penitent, which start at one o’clock, and end at twelve o’clock. Each frame within each cycle has been carefully aligned to ensure that the concentric cycles are in approximate synchrony, and the individual contents have been aligned so that the page can be read in a single orientation. Workshop of Hieronymus Bosch or follower, The Seven Deadly Sins and The Four Last Things (c 1510-20) (CR no. 34), oil on poplar panel, 120 x 150 cm, Museo Nacional del Prado, Madrid. Wikimedia Commons. Now believed to have been painted by one of Bosch’s workshop, or a follower, The Seven Deadly Sins and The Four Last Things (c 1510-20) is a much later work, and makes the odd design choice of rotating the images within frames according to their position on the circle. Many artists have used spatial layout for multiplex narrative, rather than separating each scene out into a frame. Hans Memling (c 1433–1494), Scenes from the Passion of Christ (1470-1), oil on oak panel, 56.7 x 92.2 cm, Sabauda Gallery, Turin, Italy. Wikimedia Commons. 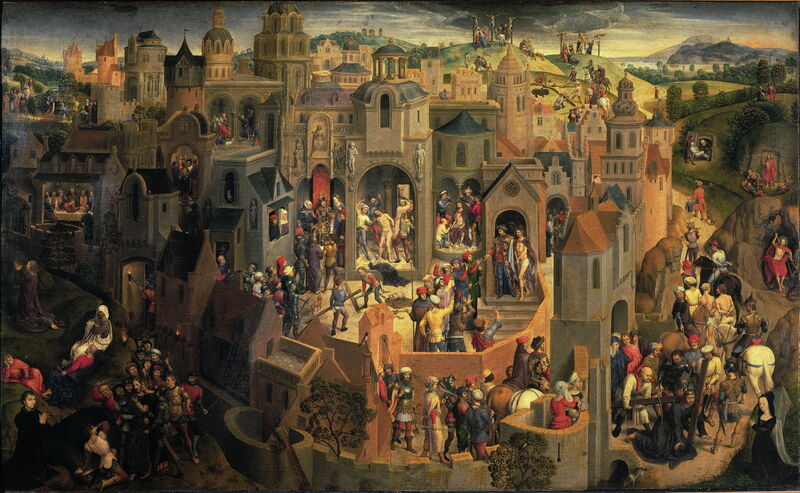 Perhaps the most extensive and ingenious example is Hans Memling’s Scenes from the Passion of Christ (1470-1), in which each of the individual scenes making up the passion as a whole is located in a different part of a fictionalised aerial view of Jerusalem. Because these scenes are not placed in separate frames, they form multiplex narrative, with the same subject, Christ, appearing in each one. 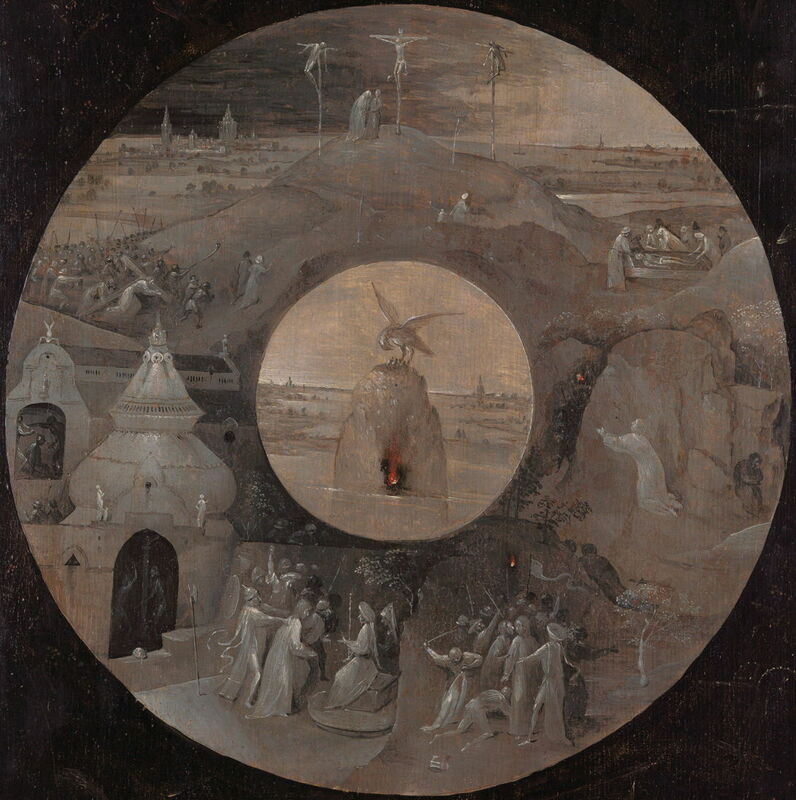 Bosch’s Passion Scenes (c 1490-95) consists of an outer background which is very dark here, containing various individual figures, surrounding a circular area in which he has painted scenes from the passion. 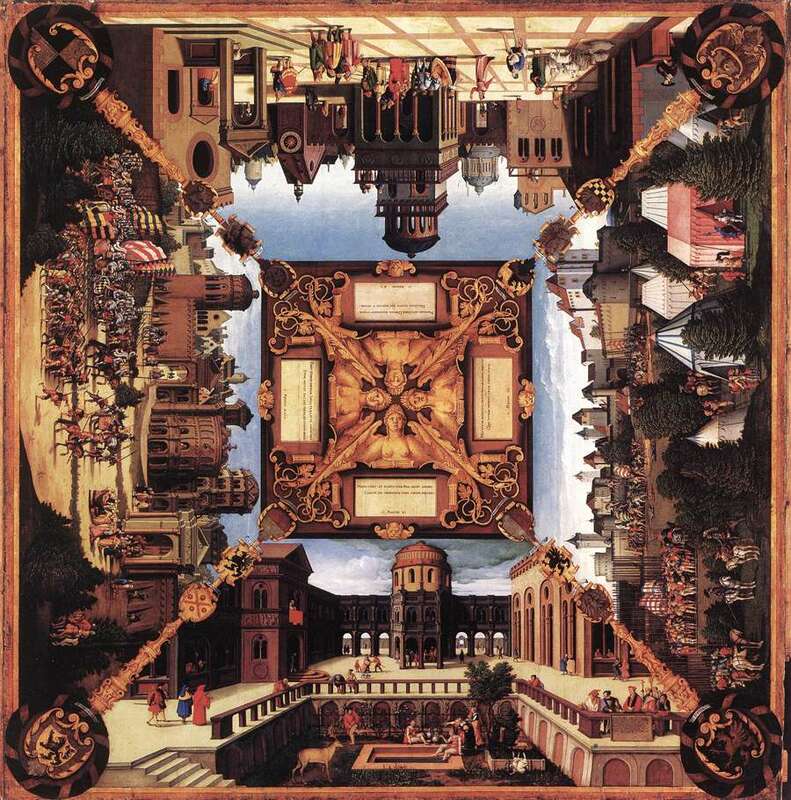 As the reverse of a panel for an altarpiece, it could only be viewed in one orientation, so the whole of this painting shares the same orientation. The lower two-thirds of the scenes are carefully divided into frames, five in total, but the upper third merges its three scenes into a single multiplex image, in which Christ appears three times: at the left carrying his cross up to Golgotha, at the top on the cross, and at the right his body being laid in a coffin for burial. This uses a common location for those three scenes in an ingenious composition. The central image of a pelican feeding its young from its own blood not only sets the moral theme of self-sacrifice, but also solves the problem of how to bring the peripheral scenes together in the centre. The peculiarity resulting from this otherwise ingenious composition is that the narrative sequence begins at the five o’clock position, in order to accommodate the resurrection scene at the tomb, at the right. Bosch leaves the viewer to work that out, which should have been an easy task in this case, given the familiarity of contemporary viewers with the stories shown. Only Bosch, in this singular painting, brings together multi-frame and multiplex narrative modes, arranged around a circular area, in this way. The modes and layout enhance the telling of the story in a way that I have not seen in any other painting. Unless you know of another? Posted in General, Painting and tagged Beham, Bosch, de Brailes, Ferrari, Francken, Memling, narrative, painting, Pellegrini, Rozhnov, Tiepolo. Bookmark the permalink. Thank you. When I was preparing to write about this painting, its narrative looked very clear and well-formed, and it did not strike me as being so unusual. It was only when I started to analyse that narrative that it occurred to me how sophisticated it is. We don’t normally associate Bosch with sophisticated narrative – perhaps the other unusual features overwhelm.